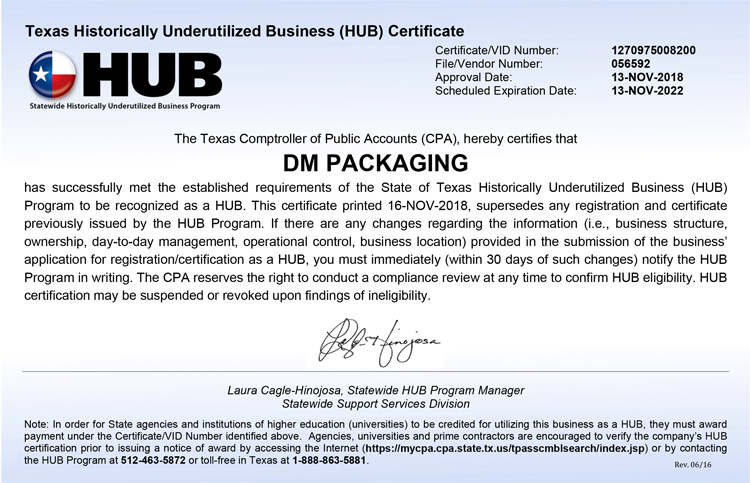 Note: DM Packaging is now an Approved HUB (Historically Underutilized Business) for the State of Texas. DM Packaging is continuously adding to its wide range of packaging products. If you would like automated assistance in getting a quote for your WHOLESALE ORDER, please use our online quote request form. For more urgent assistance, please contact us at the numbers listed below. For complete contact information and addresses, please see the Location page. If you prefer, complete this form and we will respond promptly to your bulk packaging questions or comments.